The problem escalates when one of the portraits steps off the canvas and begins wreaking havoc in the city. Bryony must find a way to escape from her attic prison, evade her aunt and uncle, and avoid paintings that want to kill her. Aided by the weird brother and sister who live next door, she sets out to break her family curse and track down her never-met mentor, who can hopefully offer her the family and home she has never known. Bryony and her friends quickly learn that breaking a curse demands they trust their resourcefulness, but it is their untested courage they’ll need to turn to before it’s all over. I read this book because I was curious about E. Latimer’s recent work. I heard her speak at a Wattpad panel event at the 2013 Vancouver Writers Festival. She was articulate, encouraging and supportive of other writers, and her self-published books had been read by millions of Wattpad readers. Unfortunately, when I read one of her Wattpad novels, I was constantly distracted by the grammar, spelling, and punctuation errors. Putting an interesting story out into the world isn’t enough, especially these days when social media makes it easy for everyone to publish their tome. The problem is that competition for readers is fierce. New writers are always welcome—there will never be a shortage of stories that should be told—but writing skills must be evident in the work put out into the world. E. Latimer is now being published by a major publishing house—Tundra Books of Penguin Random House— and, along with her additional years of writing and work experience as a literary intern, her novels reflect her confident writing hand. I look forward to reading more of her work. 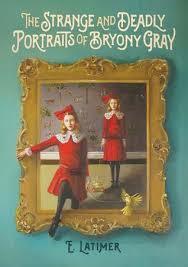 Latimer has attempted to write a dramatic spin on Oscar Wilde’s classic novel, The Picture of Dorian Gray. Unfortunately, there are so many other versions and updates on the original, from approximately 27 films and TV series—most recently the show, Penny Dreadful—to numerous books, plays, and even a musical, that when a well-trodden storyline is the base of one more tale, the work needs to stand out in a unique way. I’d give this novel a 2.9/5. It is targeted at middle grade readers, and has some “light” horror, just enough to make you want to pull the drapes at night when you’re home alone. Latimer’s website, http://www.elatimer.com/, is eye-catching with gothic-style fonts and design; it invites you to read further and is worth a look. You can also see her on a vlog at Word Nerds: https://wordnerdsvlog.com/portfolio/e-latimer/, when she shares some tips on how to find out what editors and publishers are looking for, plus does book reviews. NOTE: You might also be interested in checking out Wattpad if you aren’t already familiar with this platform. It’s a community of millions of readers and writers sharing their written work and their comments in 50 languages. You can upload a story you’ve written and get feedback from all over the world. Or you could be the reader and editor. It’s a fun way to connect with people who like the kinds of books you read, or write.